Quality taping and jointing performance is necessary to prevent adverse consequences after repair. Plasterboard is a universal material that is used to install not only suspended ceilings, but also arches, partitions and other overlappings. This material gives a possible to obtain a perfectly flat surface. Certain gaps - joints - the boundaries of the connection between two plasterboard sheets - are formed while construction of plasterboard is created on any surface. Smooth and even surface is impossible to obtain without seams processing and filler. Therefore, the next stage after installation is surface finishing, which includes the processing of joints. This process is also called taping and jointing. Surface finishing is a very important and responsible process, so the overall view of construction depends on the result and quality of performance. The impeccable finish can be achieved provided that the work is done correctly in a certain sequence, as well as its durability. In addition to detailed adherence to the rules for finishing accuracy should also be taken into account. The specialists of Vitaliti Contractors LTD company not only perform the high quality processing of constructions but also help to select the appropriate materials, including the tape and filler. The strength and durability of the plasterboard construction depends on the correct processing of joints that occur during the installation of drywall to the surface. Since the plasterboard can move under the influence of temperature and moisture, this is most evident at the joints of the boards, as the most vulnerable place in the plasterboard construction. The skill and professionalism of specialists without doubt will be the guarantee of an excellent result. But also it is equally important to choose the high-quality filler and connecting tape. In the process of sealing gypsum plaster joints the following types of connecting structures are used: paper tape, self-adhesive, non-woven and the tape with metal strips, which is used to tape and joint external angles other than 90 degrees. - minimum thickness. 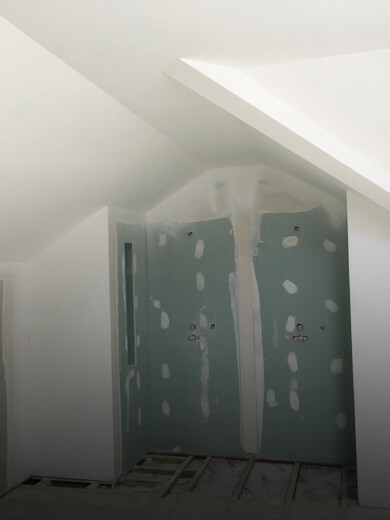 Due to this, the tape can be used for strengthening even already treated surfaces, as it flawlessly combines with the drywall sheet and filler, forming a single whole after drying. Of all the existing tape manufacturers for taping and jointing the most popular brands are Knauf, NextBuild and Sheetrock. However, the most high-quality and reliable is the Knauf adhesive-free paper tape, because the first-class raw materials with excellent strength are used during the manufacture process. In addition, a special strong grade of paper is threaded with a glass fiber in the process of producing the tape, making it more durable. It also has a roughness for better coupling with the filler, and a special fold in the middle for simplification of the drywall internal corners sealing. Knauf tape is a quality material used for taping and jointing, and also has a number of additional advantages: strength, reliability, durability, non-toxicity, air permeability, and it perfectly processes the seams and does not tear from wetting. There are practically no disadvantages. However, in the case of applying an insufficient amount of the filler, air bubbles may appear on it.